A Memorial Service honoring Helen’s life will be held on Thursday, March 21, 2019 at 7:00 p.m. at the Piasecki-Althaus Funeral Home, 3720 39th Avenue, Kenosha, WI. Private inurnment will take place at Sunset Ridge Memorial Park at a later date. A gathering of relatives and friends will be held on Thursday from 5:00 p.m. until the time of the service. The family suggests that in lieu of flowers, memorial remembrances to the Safe Harbor Humane Society, 7811 60th Ave, Kenosha, WI 53142, would be appreciated. 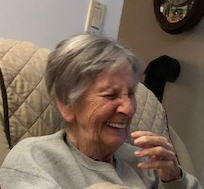 Helen Bell, age 80 of Kenosha, passed away peacefully with her family by her side on Saturday, March 16, 2019. Born in Fence, WI on November 20, 1938, she was the daughter of the late Harry and Lenora (Eastman) Buckman. She lived in the UP and was a proud “Yooper”. In 1959, she moved to Kenosha making it her new home. In January, 1960 at First United Methodist Church, she was united in marriage to Patrick Bell. After 28 years of marriage, he preceded her in death in August, 1998. Helen was employed as a nursing assistant with the Southern Wisconsin Center. She was a dedicated employee and enjoyed her 30 years of service. She liked taking care of her garden; and especially loved her beautiful flowers. Helen liked to shop, crochet, and she held a special place in her heart for her two dogs, Zoe and Gabby. Helen is survived by her son, Patrick L. Bell, Jr.; her daughters, DeAnn Gandia and Dana (Mark Hielsberg) Bell; her six grandchildren, Raymond Gandia, Erin (Alan) Knack, Corey (Katie) Shisler, Serena (Jeff) Keuch, Briana Bell and Nathanael Shilhavy; her ten great grandchildren, Gabriel, Jude, Josephine, Augustine, Serenity, Marlee, Joselyn, Brennan, Parker and Annabelle; and her two sisters, Luella (Jack) Beaudette and Catherine (Robert) Markham. In addition to her parents and husband, she was preceded in death by four brothers, Sylvester, Donald, Russell and Marlon Buckman; and her son-in-law, Raymond Gandia.